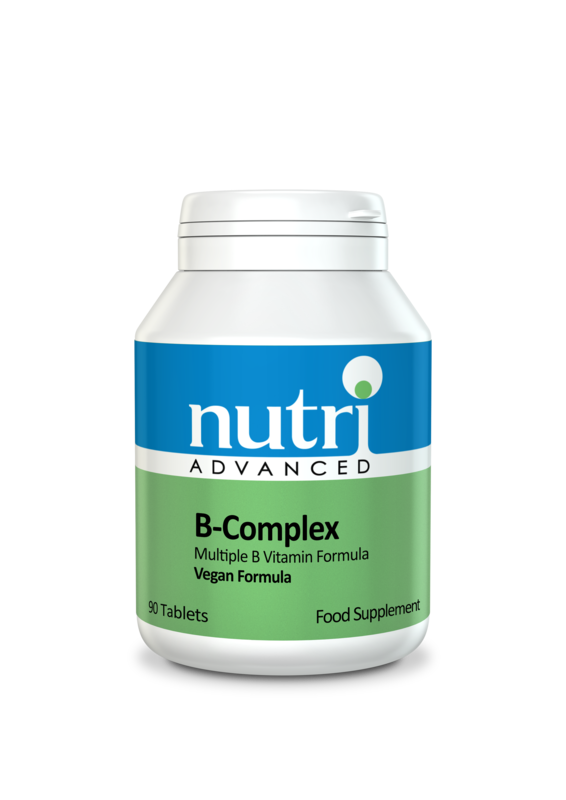 B-Complex is a total formula that employs the synergistic action of all the B vitamins. Additionally, it is boosted with choline and inositol, which are vitamin-like substances that participate in fat metabolism. People who are exposed to stressful situations, or who have a poor dietary intake, may choose to supplement with B-Complex. B vitamins are required for the release of energy from carbohydrates, fats and proteins. B vitamins are essential for the healthy function of the nervous system. Choline is a main constituent of all cell membranes, and is a precursor to the neurotransmitter acetylcholine. B vitamins enable the body to deal more effectively with stress. B vitamins help achieve the correct balance of hormones. B vitamins help maintain healthy skin, hair and eyes. B-Complex is suitable for vegetarians and vegans. 1-2 Nutri B Complex tablets daily with food, or as professionally directed. 50mg Vitamin B1 (thiamin HCl); 50mg Vitamin B2 (riboflavin); 50mg Vitamin B3 (niacinamide); 50mg Vitamin B5 (D-calcium pantothenate); 25mg Vitamin B6 (pyridoxine HCl); 25mcg Vitamin B12 (cyanocobalamin); 200mcg Folic Acid; 50mcg Biotin; 50mg Choline (bitartrate); 50mg Inositol; 25mg PABA (para-Aminobenzoic Acid). Dicalcium phosphate, microcrystalline cellulose, silicon dioxide, stearic acid. This product may cause urine to turn bright yellow. This is harmless and indicates the body is eliminating any excess vitamin B2 (riboflavin). An increase in daily liquid intake should bring the urine back to the normal or near normal colour.